Summer break is upon us and I finally have time to share something I've been growing increasingly passionate about during the last several years...FINANCIAL LITERACY! Four years ago my department leader came to me and asked if I'd be interested in teaching a new semester course that all of our senior students would be required to take before graduating. The course would be focused on both financial literacy skills and on civics and I would be tasked with creating the new curriculum. This sounded both daunting and exciting all at once! That summer I set about gathering resources and doing some research to figure out what exactly the course would cover (Pinterest is a great place to gather ideas). I asked myself what skills I would have wanted to know if I could go back to my late teens/early twenties. I also thought about what skills I DID know that really helped me start my adult life. And so, a new course was born! 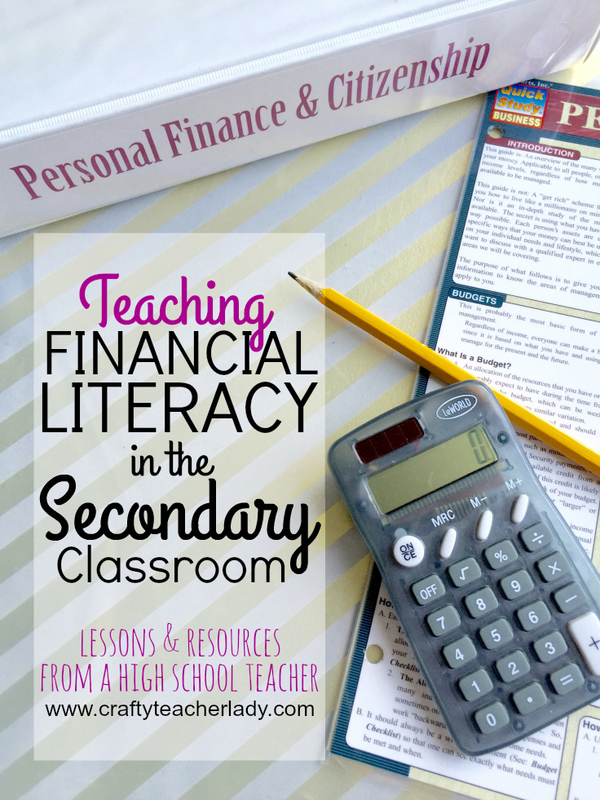 I plan on writing a 3-part series about financial literacy in the high school classroom. This first post will focus on providing an overview of the major topics covered in the course. In subsequent posts, I will be sharing a comprehensive list for TEACHERS of the best resources & lessons that I've used with my students & will also be creating a list of resources FOR MY KIDDOS who've already graduated and often email asking for links to some of the resources we've used in class. They want access to these resources now that they are actually out in the 'real world' and applying the knowledge they've learned (most of them don't keep their binders from high school nor do they have access to our Google Classroom page once they've graduated). One semester can seem like a short time in which to teach all of the financial literacy skills I'd ideally like my students to know (a portion of the course is also dedicated to civic literacy), however, below is a break down of each of the units/topics we do cover. The units also have 'enrichment' topics that help to enhance the basic skills being taught. -How much should one borrow to pay for college? 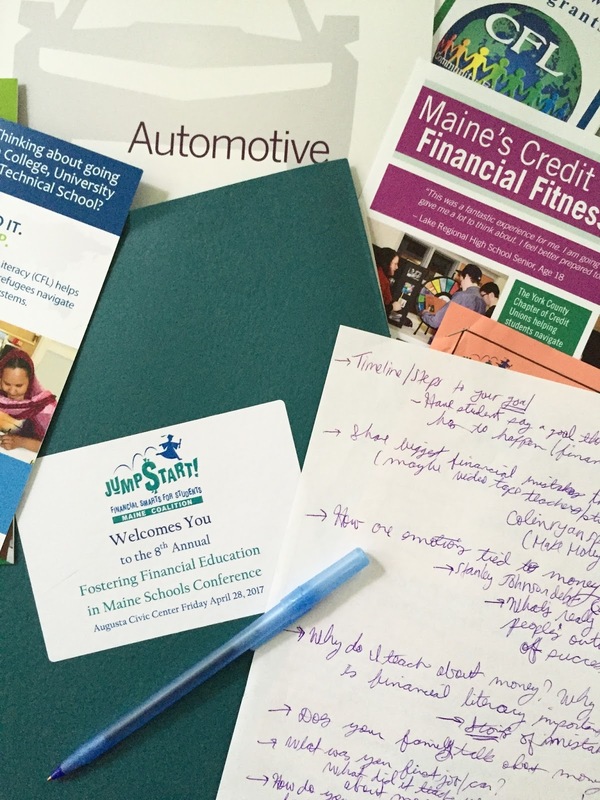 Back in April I attended a financial literacy conference hosted by the Maine chapter of the Jump$tart Coalition of Financial Literacy and got some fantastic resources. The BEST resource shared at the conference (in my opinion) is a website for educators looking to teach financial literacy called Next Gen Personal Finance. What I really like about this website is that it's completely free, you don't have to log in or enroll to access the materials, and it's basically a complete financial literacy course broken down by unit with lots of different types of lessons. There are interactive group activities, daily discussion questions, links to videos and simulations, and teacher guides. Hello?? Where was this resource 4 years ago when I needed it?? Ha ha! If you are considering teaching or are about to teach financial literacy skills to young people you should absolutely visit the Next Gen website as a place to start. Having taught personal finance for 4 years already, I am thoroughly impressed with the materials they've come up with! It also validated what I've chosen to teach my students because many of the resources I already use are included on their website! *UPDATE: After writing this post, Tim from Next Gen reached out to me and asked if I wanted to be on his podcast! You can listen to my podcast interview HERE! Teaching financial literacy is incredibly rewarding. I KNOW my students walk away with skills and knowledge they will and have used in their adult lives. I've received lots of feedback from students about how much they've learned in the class and how much more confident they feel about starting their post-secondary lives. Parents also tell me that our activities in class have led to a lot of interesting and important discussions at home with their kids about finances and 'life beyond high school'. It's a wonderful feeling to know that what I am teaching is truly helping my students! Stay tuned for part 2 of this series where I will be providing a list of great financial literacy resources for my students to use once they've graduated and are in the 'real world'. In the meantime, find me over on Instagram!